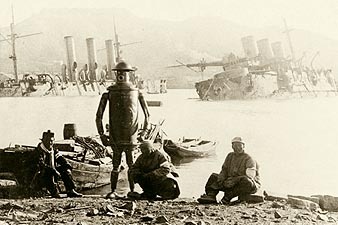 On February 8, 1904, Archibald Campion and Boilerplate were in Port Arthur, Manchuria when it was attacked by the Japanese. Ironically, less than six months earlier, the professor and his creation were in Japan as part of an American delegation of inventors. Japan felt that it had been backed into a geopolitical corner by the expansionist Russians. Even Western powers were concerned about the Czar's aggressive foreign policies in the Far East. Japan believed a preemptive strike at Russia's outlying territorial possesions in Manchuria was its only recourse. This political cartoon, intended for foreign distribution, was published by Japan a month after the start of the war. 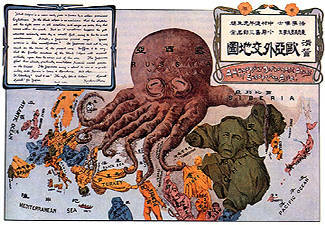 Entitled "A Humorous Diplomatic Atlas of Europe and Asia," it depicts Russia as a "black octopus." In the wee hours one Sunday morning, without warning, fast-moving Japanese torpedo boats attacked the main body of the Russian fleet anchored at Port Arthur. It was a success, and the following year the Imperial Japanese Navy defeated the remaining Russian ships in the Battle of Tsushima Strait--the third largest fleet engagement in naval history, after the defeat of the Spanish Armada and the Battle of Trafalgar. Not long after the torpedo sneak attack on Port Arthur, the Japanese commenced a land-based siege of the city. 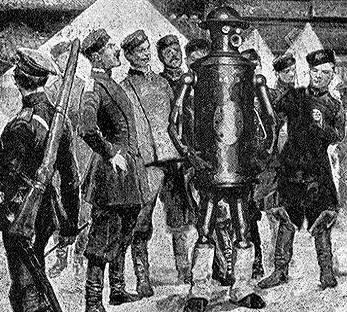 Campion and Boilerplate were attached to the American military observers, who remained in the city until the Russians surrendered it four months later. Above: The Russian fleet at anchor in Port Arthur, days before the Japanese torpedo attack. 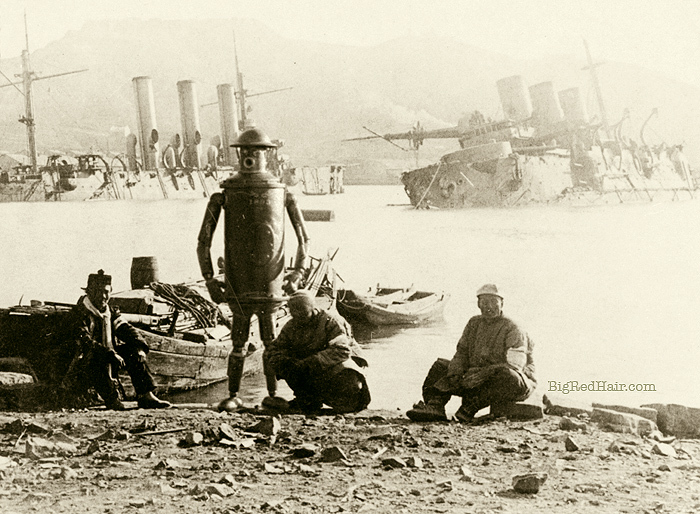 Below right: Local Manchu sailors pose with Boilerplate before sunken Russian ships in Port Arthur. Japan's triumph over Russia in a full-scale war was a shock to Western nations. Only a few score years earlier, Japan was an isolated, feudal country, complete with lords in castles and samurai "knights." Its most sophisticated craft was swordsmithing. In perhaps the most severe technological lurch forward that any human culture has ever experienced, a century of science and industry were assimilated in decades. By the turn of the century, Japan had familiarized itself with telegraphs and telephones, railroads and automobiles, steam turbines and heavy industry. 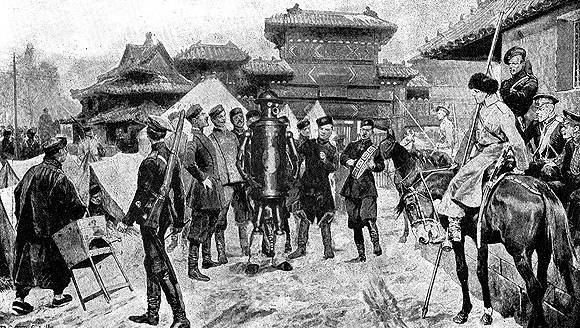 Boilerplate finds itself the center of attention from Russian troops stationed in Manchuria. Click on image to view a large, uncropped version of this illustration.